Refurbished 4 prong low profile electric meter with a polycarbonate cover. Easy read cyclometer. 240 V, 3 wire, 60 Hz. Max rated amperage is 200 amps. Single Phase. Class 200. Form 2S. Meters will fit any ANSI rated 4-terminal RV power box meter socket. See below to order optional meter kit, tamper proof seals or meter rings. 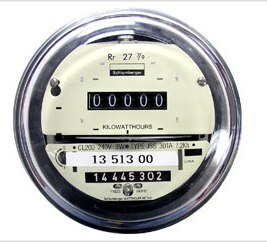 Go to top of this Refurbished Low Profile Electric Meter for RV Power Outlet Box,4 prong page.